A binational panel with three Canadians and two Americans has been formed to review the softwood lumber dispute (Globe & Mail subscribers only); while a tentative truce between the US and China is seen as good news for US wood molding and furniture manufacturers. 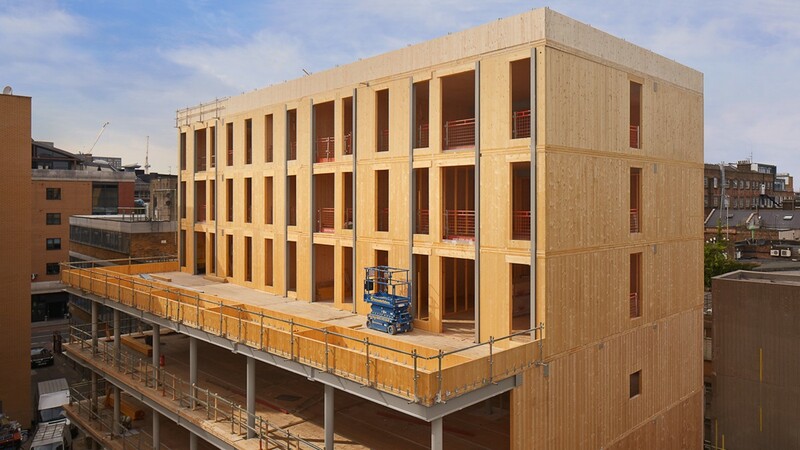 Architects say the UK ban on CLT above 18 meters is an “overreach” as CLT is safer than steel, while the Timber Trades Journal says the “trend towards timber will continue“. In related news, PEI’s building code now allows for wood residential buildings to have a fifth floor. Does the thought of putting up the Christmas tree fill you with dread instead of excitement? Do you have visions of tissues and antihistamine instead of sugarplums dancing in your head? Christmas trees and other decorations can trigger allergies in many people. Tree sap, pollen and terpenes — compounds that give pine trees their scent — can all make allergy sufferers sneeze. …Live trees can be full of mold. A study last year at SUNY Upstate Medical University found 53 kinds of mold in live Christmas trees. Most of those molds are potential allergens and are known to increase the risk of wheezing, persistent coughing and allergic sensitization in infants. …If pollen is a problem, consider buying a Leland cypress tree. According to the National Christmas Tree Association, this hybrid is the most popular Christmas tree in the Southeast, and does not produce pollen or sap. Canada’s forestry-products industry says poor rail service has cost it $500 million this year, and the capacity crunch will only intensify if more Alberta oil ends up on Canada’s rail lines. 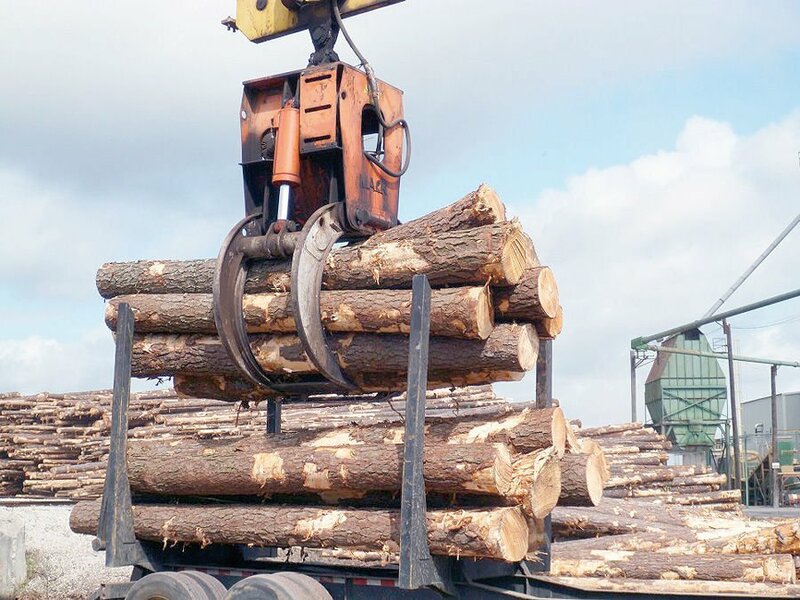 “We’ve had a really difficult year in forest products (because of insufficient) rail service,” Derek Nighbour, CEO of the Forestry Products of Canada Association, told iPolitics. “We lost about $500 million this year based on delays and rail cars not showing up when they’re supposed to.” This is despite ongoing and “active” conversations with the railways about how to ensure product moves all year round — including through the winter, he says. “Winter is always a question mark. … Winter comes every year … and we’re kind of holding our breath (and) hoping that we’re not going to see significant deterioration of service and access,” he said, noting that pulp products can’t be stored outside. BUENOS AIRES – The U.S. and China have called a temporary truce in the trade war. …Even though many issues remain unresolved, the concession by both sides was significant. See the NYT story. The U.S. implemented 10 percent tariffs on an array of Chinese imports September 24. On January 1, the rate would have risen to 25 percent – affecting $250 billion worth of products. …Wood products facing a tariff include oak, beech, maple, ash, cherry, moldings, rods, particleboard, various types of plywood, doors, charcoal, corks, and stoppers, and wicker and bamboo baskets. Furniture items include bedding, mattresses, car seats, wood chairs, furniture designed for offices, kitchens, chandeliers, and lamps. Data from China’s Customs Department show the value of wood products trade between China and the U.S. fell 16 percent in March 2018. China’s imports also dropped by 5 percent. Money indeed grows on trees in South Carolina! The forestry and forest products business contributes more than $21 billion to the state economy and creates at least 84,000 jobs. …The Wall Street Journal recently published a forestry-related article titled “Thousands of Southerners Planted Trees for Retirement, It Didn’t Work Out.” …The article indicated that a “wall of wood” caused by tree plantings from the Conservation Reserve Program is partly to blame for the current market conditions. …What is “wall of wood”? The words refer to current oversupply of mature trees partly due to the Conservation Reserve Program’s tree-planting incentives back in late 1980s. …Will it go away? Of course, nothing is permanent, so it should go away. But how long will it take for timber prices to improve again depends on timber demand and the overall health of our economy. Timber demand is largely derived from the housing market. P.E.I. is rolling out the 2015 National Building Code (NBC) — the last province in Canada to do so — in a move that is being applauded by the head of the Construction Association of Prince Edward Island (CAPEI). “The biggest impact on the island is that it will put builders on the same playing field,” says Sam Sanderson, general manager of CAPEI. …He says one area of the new code that will affect the industry is that it allows for wood residential buildings to have a fifth floor, up from four under the 2010 NBC. “We are seeing a couple of developers holding off on a couple of projects until the 2015 code is adopted to allow for that extra storey,” says Sanderson. CAMBRIDGE, Mass. — The Harvard Center for Green Buildings and Cities at the Harvard Graduate School of Design announced today the completion of HouseZero, the retrofitting of its headquarters in a pre-1940s building in Cambridge into an ambitious living-laboratory and an energy-positive prototype for ultra-efficiency that will help us to understand buildings in new ways. The design of HouseZero has been driven by radically ambitious performance targets from the outset, including nearly zero energy for heating and cooling, zero electric lighting during the day, operating with 100 percent natural ventilation, and producing zero carbon emissions. The building is intended to produce more energy over its lifetime than was used to renovate it and throughout its subsequent operation. Snøhetta was the project’s lead architect and Skanska Teknikk Norway was the lead energy engineer. The move towards timber construction will not be thwarted by a change to building regulations aimed at banning use of combustible materials in new residential buildings over 18m, says the Confederation of Timber Industries (CTI). The CTI’s statement follows a Government announcement of an amendment to part B of the building regulations aimed at improving fire safety post-Grenfell. …“Flame retardant timber cladding remains incredibly popular and the consultation response has confirmed its’ suitability for all building types below 18 metres. …“For other structural timber such as cross-laminated timber, it is clear that architects and designers may now have to look at new design strategies for the external wall build ups in taller buildings. 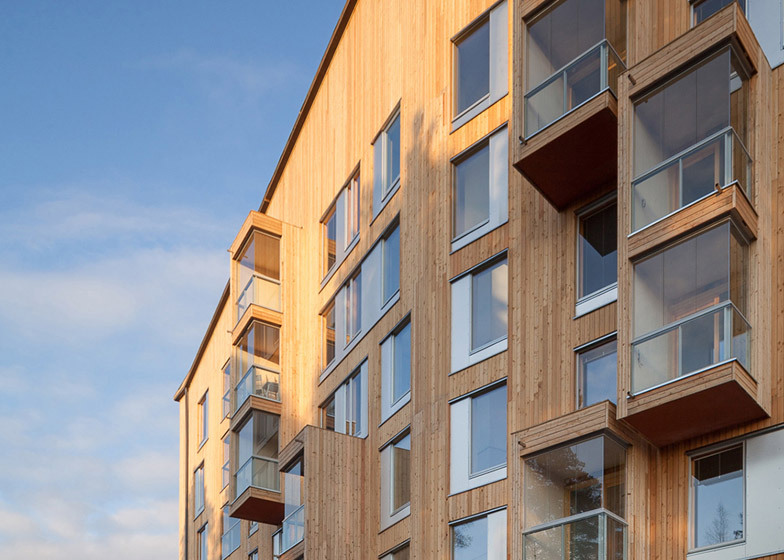 Engineered timber products such as cross-laminated timber must be exempt from the UK government’s ban on combustible cladding materials, as they are essential in the global battle against climate change, say architects. 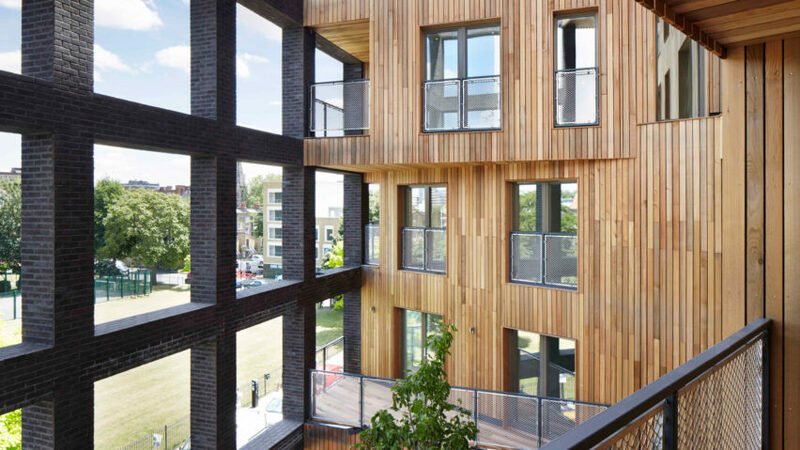 Waugh Thistleton co-founders Andrew Waugh and Anthony Thistleton and dRMMfounding director Alex de Rijke have all urged the government to review its legislation, which prohibits the use of timber products on the external walls of residential buildings taller than 18 metres. Waugh and Thistleton said the new policy “demonstrates a misunderstanding of the fire performance of engineered timber”. “We are clear that mass timber construction is not a valid target for this change and will continue to advocate for its exemption,” said the pair. De Rijke, who has completed many buildings using cross-laminated timber, said the material is safer than steel in a fire. OTTAWA – Canada risks losing some emblematic pieces of the biodiversity puzzle. The Committee on the Status of Endangered Wildlife in Canada (COSEWIC) determined that a widely-distributed tree (Black Ash), our largest land predator (Polar Bear), and many populations of our biggest salmon (Chinook) are at some risk of disappearing from Canada. In less than two decades, an exotic beetle named the Emerald Ash Borer has killed roughly two billion mature ash trees in the North American Great Lakes Region. …Many city parks, including those in Toronto, Montreal, and Ottawa, have already lost most of their ash trees, including Black Ash. …Another widespread species considered by COSEWIC was Polar Bear. To hunt seals, its most important food source, these bears use sea-ice and some of the same sit-and-wait techniques familiar to ice fishers. …COSEWIC also examined the status of Chinook Salmon, the king of the Pacific Coast salmon species. OTTAWA – Canada’s natural landscapes inspire pride from coast to coast to coast: Canadians love our mountains, lakes and rivers, as well as our coasts, forests, and wildlife. Nature is important not only to our cultural identity but also to our health and prosperity. That’s why the Government of Canada is doubling the amount of protected nature in Canada’s lands and oceans by 2020. Today, Environment and Climate Change Canada launched the Target 1 Challenge, part of Canada’s Nature Fund, which will provide up to $175 million for projects that help meet Canada’s biodiversity target 1 of protecting 17 per cent of land and inland water by 2020. Federal funding will be matched by partners, doubling financial support to protect Canada’s nature. This funding is part of Budget 2018’s historic $1.3 billion investment in nature. 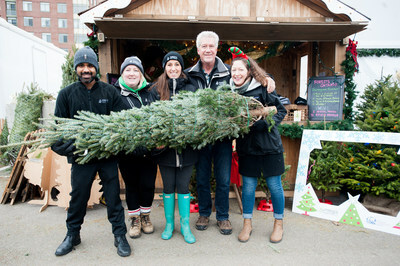 TORONTO – On Saturday, December 1st, the fourth official National Christmas Tree Day, Canadians across the country took the opportunity to celebrate the joy Christmas trees bring into our homes. However, it is also important to consider the other benefits Christmas trees can provide! “Celebrating the holidays with a real tree is an excellent way to support local jobs and Ontario’s economy,” explains Forests Ontario CEO Rob Keen. “Christmas trees contribute to the province’s economic wellbeing as most trees are grown on farms, which create employment and reliable income for families.” It is estimated that more than 500 farmers produce upwards of one million Christmas trees in Ontario each year. On top of that, the Christmas tree industry creates jobs in transportation and retail. Real Christmas trees support a healthy environment, too! HALIFAX — Nova Scotia will adopt sustainable forestry practices that will see reduced clearcutting on Crown land, although the province’s lands and forestry minister is unable to say yet by how much. Iain Rankin said forest policies will be guided by ecological practices through the so-called “triad” model — some areas protected from all forestry, others dedicated to high production including clearcutting, and others harvested with a “lighter touch” and limited clearcutting. …However, the minister said the government is avoiding a set target for now, while it studies the reduction numbers included in Lahey’s report. …In August, Lahey said a reduction in clearcutting on Crown land could reduce the overall wood supply for industry, but Rankin said he doesn’t believe that’s the case. “We don’t accept that there will be a reduction or a contraction,” Rankin said. A year ago, President Donald Trump announced the largest rollback of federal land protections in American history when he proclaimed the reduction of two western national monuments: Bears Ears and Grand Staircase-Escalante. With no mention of the Katahdin Woods and Waters, you may have thought Trump’s presidential reach was not coming to our monument in Maine. Think again. Federal Judge Tanya Chutkan in Washington, D.C. is considering a case about those western monuments. …While the Department of Justice asserts wide-reaching executive authority…The Interior Department has also begun a planning process for Katahdin. Interior Secretary Ryan Zinke has explained his recommendation for “ active timber management” in Katahdin Woods and Waters as not a free license to the timber industry. 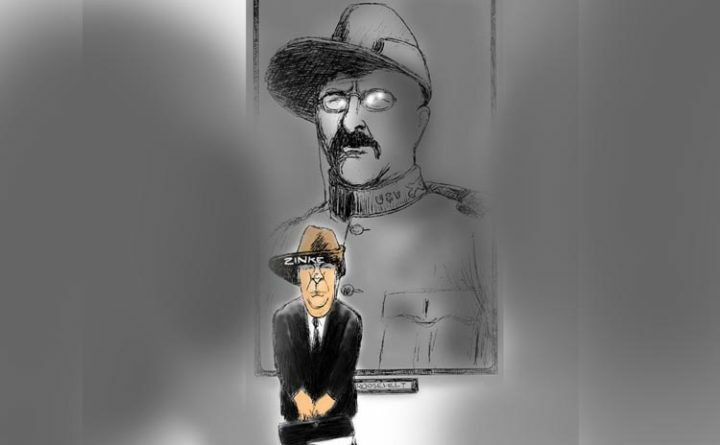 But the Monument Management Plan, not Zinke’s statements will define what “active timber management” will be allowed. DAVIS, Calif. — In the wake of California’s most destructive and deadly wildfires, USDA’s Natural Resources Conservation Service (NRCS) in California has a message for private forestland owners: We have technical and financial assistance to help you improve the health of your forest and reduce wildfire hazard. …Suarez says that investments in conservation on forest land has jumped significantly for NRCS California in recent years, going from about five percent to 10 or more percent of the Agency’s funding through the Environmental Quality Incentives Program. 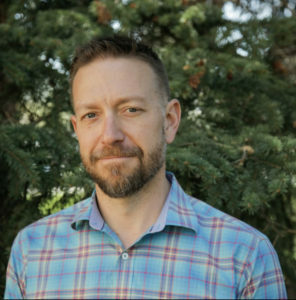 Michael Falkowski, an ecosystem scientist at Colorado State University, will be at the Kennedy Space Center …watch the launch of the SpaceX Falcon 9 rocket, which will be carrying supplies, science experiments and an earth observation sensor to the International Space Station. …[He is part of] a team of researchers that will use data collected by the sensor to craft three-dimensional maps of the world’s temperate and tropical forests with unprecedented levels of detail and spatial coverage. …the project is known as the Global Ecosystem Dynamics Investigation — or GEDI, pronounced “Jedi” …From the station, GEDI’s advanced laser technology will uncover the three-dimensional structure of forest ecosystems around the globe. …In addition to studying forest carbon, the researchers will also use GEDI data to assess biodiversity trends and water resources across the globe. There may also be some applications of GEDI data to aid in weather forecasting. Forestry issues are no longer confined to rural Oregon — it’s now a statewide issue, forestry consultant Matthew Donegan told a gathering of state business, agency and elected leaders Monday. The formation of an Oregon forest business plan now ranks among the state’s highest priorities, Donegan said. Among the plethora of financial issues addressed during Monday’s 16th Oregon Leadership Summit, the forests which cover more than half of the state were given their due. While the term “forest business plan” doesn’t resonate with trained foresters, who work in the woods, it does suggest discipline, reality, making tough choices and hard decisions, and it demands action, he said. …“When you look ahead at the amount of fuel (in the forests), the impacts of climate change, and the population growth, it is a very serious issue,” he said. Stand on the banks of Indian Jack Lake, and you wouldn’t know you’re on the eastern side of the popular Brainerd Lakes Area tourist hub. …Just a short distance away, the Mississippi River snakes through this forest. And protecting this land from being developed is part of a program called Mississippi Headwaters Habitat Corridor Project, aimed at preserving forests in the headwaters region. The nonprofit Trust for Public Land recently bought a 235-acre site here that curves around the lake and donated it to the Minnesota Department of Natural Resources, permanently preserving two and a half miles of precious shoreline. …Experts say those forests play a critical role in protecting the water quality of the Mississippi and the lakes and rivers in its watershed. …In the past, efforts to acquire private property for public use have met resistance from local government officials, who don’t like the idea of losing revenue from their property tax coffers. Attempts to mitigate global climate change should take into account geographic conditions, says a University of Victoria geographer. …Professor Johan Feddema’s research examines and attempts to model how land coverage, forest, grass, desert, rainy or urban conditions affect climate. He works on attempting to model how changing a land’s cover can alter local climate and how it might contribute to changing global climate patterns. For example, Feddema can ask what might happen if a forest is removed. “It doesn’t become a nice sound bite,” said Feddema. “In some places it gets warmer and in some places it gets cooler.” In northern ecosystems, removing a forest with its insulating effect is likely to have cooling effect, he said. But removing a tropical forest will likely heat things up because less foliage means less evaporation of water and that cooling effect is lost. It’s now over 50 years since the world was first warned that resources were being used at an unsustainable rate. It has now been estimated that almost one quarter to one third of the world’s land is degraded to some extent. …About 20% of agricultural land and 40% of forests are degraded. …Because a great deal of land has been changed to produce food, agroforestry, the practice of deliberately introducing trees into farms, is an important way to restore degraded land. 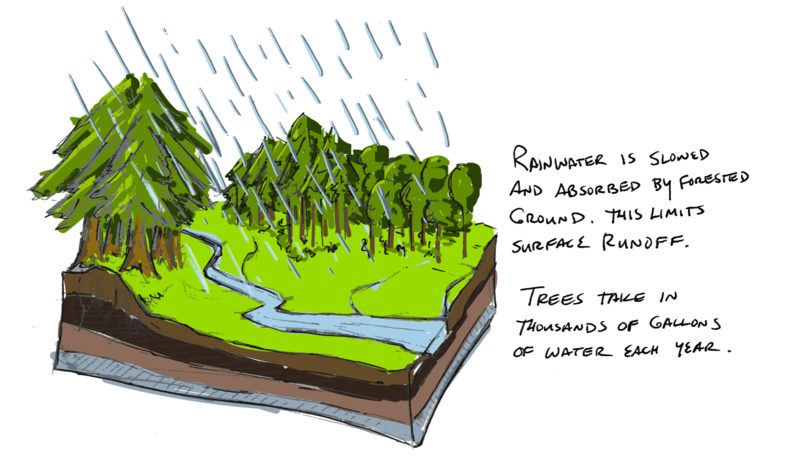 These trees, outside of forests, have tremendous commercial and ecological value. …Unfortunately policymakers have not yet caught up. Very few agricultural policies around the world promote agroforestry and few agricultural universities and training institutes include it in their syllabuses. …agroforestry gets lost between agriculture and forestry ministries and departments, often hosted in one institution and ignored by the other. KATOWICE, Poland — As leaders attending the U.N.’s annual climate summit heard fresh warnings about the dire consequences of leaving global warming unchecked, a new issue emerged Monday as a pressing concern: how to persuade millions of workers their industry can’t have a future if humanity is to have one. Hosting the talks in the heart of its coal region of Silesia, Poland tried to set the tone for the two-week meeting by promoting the idea of a “just transition” for miners and other workers facing layoffs as countries adopt alternative energy sources. …Citing a recent scientific report , the U.N. chief urged governments to aim for net zero emissions by 2050. Net zero emissions mean that any greenhouse gases emitted need to be soaked up by forest or new technologies that can remove carbon from the atmosphere.